Producing a medium-sized SUV that’s somehow ‘new’ and ‘different from the rest’ may seem like an impossible task in today’s market, but Toyota has had a damn good go with its 2019 RAV4. It’s built on a fresh global architecture GA-K platform, comes in self-charging hybrid form only and is styled in that angular, almost cartoon-like form that only Japanese designers seem to have truly perfected. Curious? So you should be, as it’s shaping up to be a welcome antidote to the slew of platform-sharing and predominantly diesel SUVs that are currently dominating UK roads – and sales charts. ‘Self-charging hybrid only’ – there must be a diesel version on the way? Nope, it really is hybrid all the way for the RAV4 with absolutely no plans for a diesel or even a pure petrol version in the UK (all-electric may be a different story but there’s currently no plans for one). That means you better get used to the 2.5-litre Hybrid Dynamic Force engine, available with 219bhp in the all-wheel drive model and 215bhp in the front-wheel drive version. Said output is split courtesy of 176bhp from the 2.5-litre petrol with the rest arriving via front and rear (the latter only on the all-wheel drive version) electric motors. 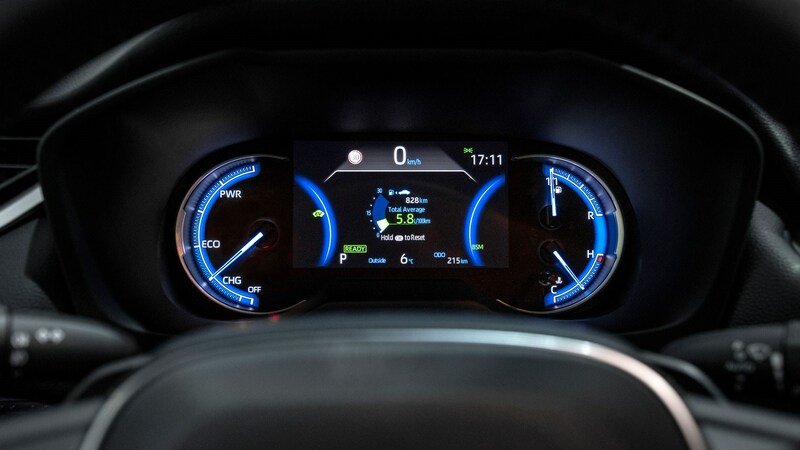 Fuel economy is naturally going to be a big talking point given the absence of diesel, and although there’s no figures yet for the all-wheel drive version, the standard front wheel drive car claims an average of up to 51.2mpg. 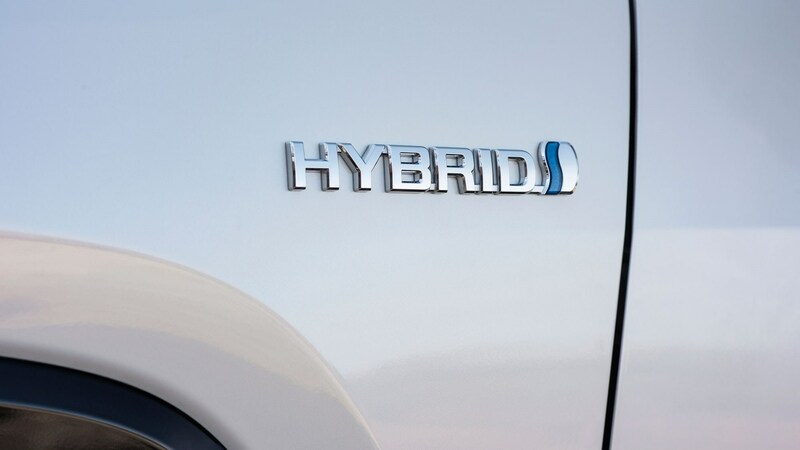 Does the hybrid powertrain work in the real world? It’s punchy enough, that’s for sure. Even in the (slightly) less powerful front-wheel drive version real-world acceleration is linear and surprisingly brisk thanks to that electric assistance. Foot down and 0-62mph comes up in just 8.1 seconds. If you’re used to effortless diesel torque and flexibility, however, it will take some getting used to. The electric motor does its best to make up for lack of torque from the non-turbo 2.5-litre engine, but it can only do so much. As a result, meaningful progress is accompanied with the familiar raucous hum that all CVT powertrains are afflicted with. It’s a shame as it spoils what is otherwise a refined driving experience, especially when cruising. There’s next to zero tyre roar and although wind buffeting is noticeable, it’s no doubt highlighted by the lack of other background noise. Predictably, the RAV4 isn’t the most exciting thing to drive with steering devoid of feel (so much so that you can barely feel the front wheels scrabbling under power) and plenty of nose dip when you lean on the grabby brakes. 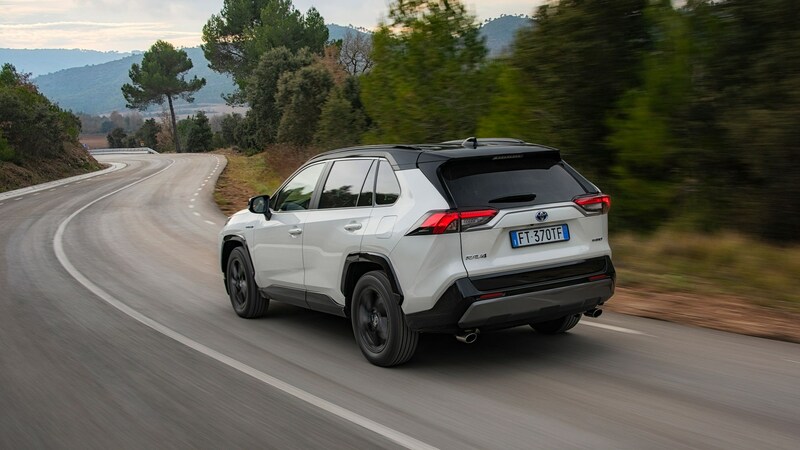 It’s unfair to put too much emphasis on such gripes, however, as – when driven normally – the RAV4 feels planted and predictable with little body roll (the body is 57% more rigid than the previous car) despite the softly sprung suspension. The latter also means the ride is comfy and composed for the most part, only struggling slightly over large potholes or expansion joints in the road. 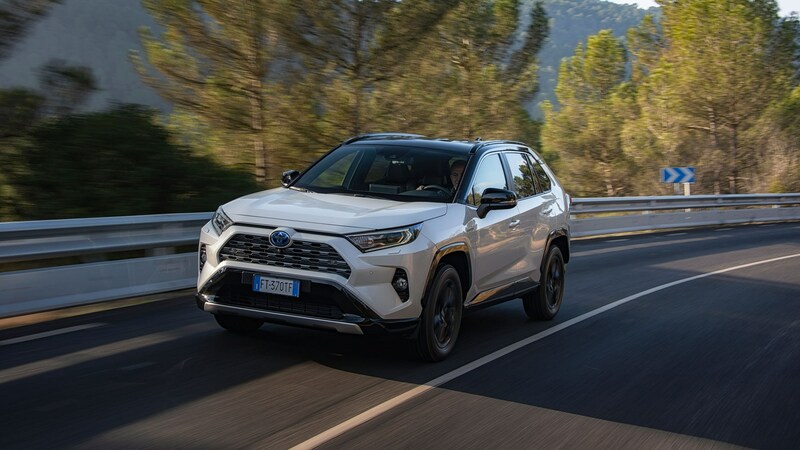 Regardless of claims that the manufacturer may make about the RAV4’s ‘sportiness’, overall it feels markedly more relaxed than most rivals despite the noisy engine. What’s the RAV4’s cabin like? Spacious is the first word that springs to mind. If you’re after an SUV that provides exceptional practicality there are far worse options out there. 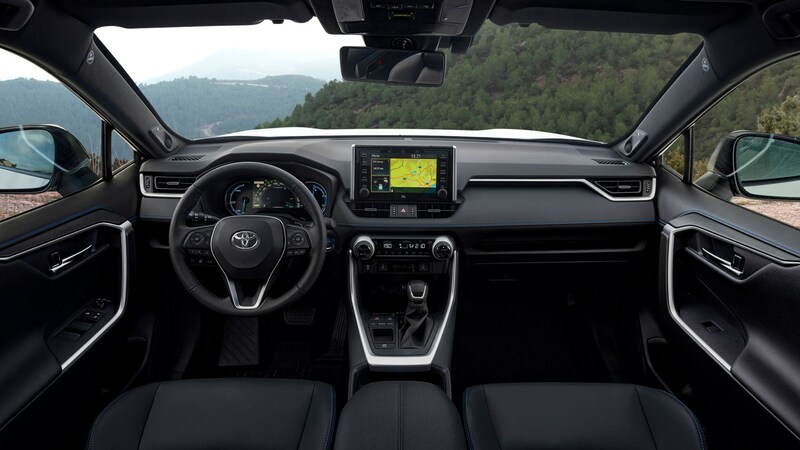 The RAV4 feels airy and light up front, with ample rear leg and headroom even with the driver and passenger seats pushed reasonably far back. The small central tunnel running through the car also means that – even on four-wheel drive models – there’s plenty of legroom for middle seat passengers. Meanwhile, lateral space between those on the rear pews has been increased by 49mm over the old car, meaning less elbowing each other in the ribs and more space for Isofix child seats. Bootspace, too, is impressive, measuring up at 580 litres with the rear seats in place and 1,690 litres with them down – larger than many rivals. As far as the interior goes, however, the amount of space on offer is the main highlight. That’s not to say there’s anything particularly wrong with the RAV4’s cabin, it just doesn’t stand out against its rivals all things considered. Like any Toyota, everything is very well screwed together and feels like it’ll last longer than the five-year warranty, but there’s plenty of cheaper plastics on show and some of the layout decisions (such as the prominence of the passenger airbag display) feel poorly judged. Sadly, the RAV4’s infotainment system is a disappointment. Toyota has had a long time to improve on what’s come in previous generation models yet the end result still lags well behind the best in class. What’s more (and while this might not matter to everyone), Apple CarPlay and Android Auto are not currently available, so it’s the manufacturer interface or nothing. Aside from this, Toyota’s Safety Sense technology has been upgraded with a high-definition camera and improved radar technology, resulting in the pedestrian and cyclist detection technology now capable of operating at night (when the majority of accidents happen). Said safety tech is fitted as standard across a four-strong range of trim levels (Icon, Design, Excel and Dynamic – Design expected to be the most popular), as is a rear-view camera and parking sensors, keyless ignition, LED headlights, an 8.0-inch multimedia touchscreen, a 7.0-inch digital dashboard display and a long list of additional safety tech included in the Safety Sense bundle. Connected services – such as Send to Car Navigation, Find my Car, Driving Analytics and Maintenance Reminder – are also being rolled out for the first time on the RAV4. Is the Toyota RAV4 any good off-road? The four-wheel drive version should certainly be able to hold its own on a mild off-road course thanks to the raised ground clearance and all-new Trail Mode setting. This uses an electronic limited-slip differential to automatically brake any wheel and apply the power to the opposite side, thus giving greater traction. Such an addition is unlikely to make the RAV4 the default choice for mud-plugging farmers, yet its capability will almost certainly outstretch the requirements of 99% of buyers. 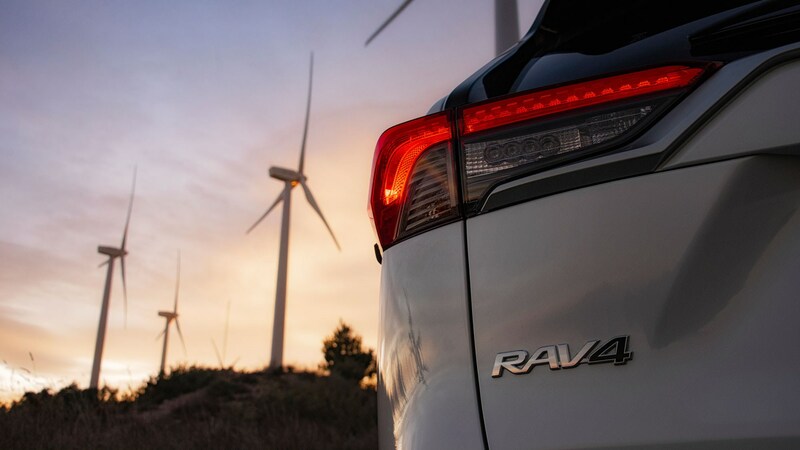 There’s plenty to like about the RAV4, from its economical low CO2 hybrid powertrain to the impressive practicality, standard-fit safety kit and near-faultless reliability record. It’s a shame, then, that the disappointing infotainment system and unpolished hybrid powertrain let the side down and mean the RAV4 doesn’t quite hit the heights of class leaders in an ultra-competitive market segment. New Toyota RAV4 SUV reviewed The RAV4 is hybrid only, with no plans for a diesel.